Alli Bartkowski has done it again... created another beautiful book - Quilled Flowers: A Garden of 35 Paper Projects. Despite claiming no green thumb, Alli certainly has what it takes when it comes to designing paper interpretations of well-known flowers. The book features 128 pages of perfectly photographed blooms, each of which is shown with a useful purpose. For example, there's a calla lily photo album, a daisy necklace pendant, framed sunflower, ranunculus hair comb, gerbera daisy pens, cherry blossoms card, and perhaps my favorite, a plumeria blossom choker. The book is suitable for those who are brand new to quilling, as well as experienced quillers in need of fresh ideas. Alli covers all of the basics - tools and techniques - and each pattern includes helpful diagrams and templates. One feature I especially appreciate is an "actual size" drawing of the completed flower... this is a huge boon to new quillers who might not realize the true size of a quilled coil. 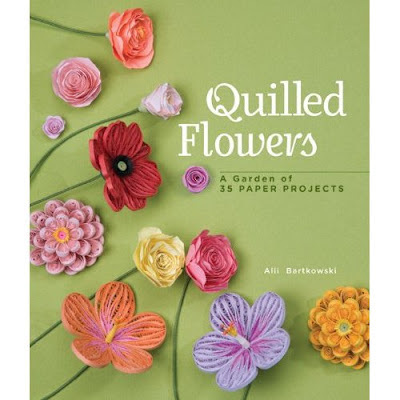 I was sent a copy of Quilled Flowers: A Garden of 35 Paper Projects from Lark Crafts for review purposes and the publisher has offered to send a copy to one person with a U.S. or Canada mailing address. It's simple to enter - just leave a comment on this post by Sunday, March 11. The winner will be selected by a random number generator, notified, and announced right here, as well as on the All Things Paper Facebook page. Good luck! Congratulations to "joyousstamper"! She has been notified and is delighted to be the winner. Happy quilling, Sharron! I love paper crafts and flowers so I would love this book ! Wow, those orchids are stunning. Would love a copy of this book. OMG those flowers are fantastic. Pick me, pick me and thanks a bunch for the opportunity to win if it's not too late because 4th of marsh was yesterday! What a lovely book !! I would just LOVE to have this. I wish I can win this. Sadly I just saw this post now...I was out if town yesterday. I hope I"m not too late. Sorry for the date error! I've changed it to this coming Sunday, the 11th. The book looks gorgeous! Thank you for posting such great giveaways! LOVE IT! Thank you for the opportunity to win! What a beautiful book...I really love the orange colors! Ohhhhhh! I SOOOO would like to win this book!!! I'm LOVING quilling & really working on trying different things! This book would be PERFECT for that!!! THANK YOU for offering it & for adding me to your entry list! Flowers are so beautiful! I love making quilled flowers, this book would be so neat to have! All things paper is a wonderful blog and I find all my inspirations from here! What a great giveaway! I have another of Ali's books and just love it! WOW!! I'm not sure I've ever seen anything quite so exquisite! !To think that I could create such beautiful things, blows me away!! I have been salivating over this book everytime I see it, wishing that some how I would be able to afford it. I have such a hunger inside of me to learn "new" ways of quilling flowers so I can make people happy with my "happies" that I make for them. I would LOVE to be the blessed recipient of this giveaway. Super fun! great for projects and beautiful coffee table book! I want this book just to look at the photos. Wow. These are amazing! I never thought to make three dimensional flowers. Wonder if Paul would make me a bouquet? I have been making very simple flowers and now I am ready to move on. I have seen more challenging flowers on the internet and 'drool' over them. I LOVE Alli Bartkoski work and would love a book by her. I like the front cover of her book. Giving a range of different types of flowers. Thank you! What a beautiful addition to Alli's quilling books! I have a copy but would love to win another one to add to our local library shelves. What gorgeous designs! I'd like to quill some flowers for spring decor, so this book would be perfect to get me going! Oh my, how I would love this book! I just discovered Quilling 2 weeks ago and I have a feeling I'll be doing it a long time, lol! Thanks for another great giveaway! Would love to win but if not loved having a "peek" inside! Ann I love to make flowers in every medium I work, which is just about all of them...lol I would love this book to make some more quilled flowers. gaah! my paper flower obsession continues! this book looks amazing! love that it includes things to do with them. What gorgeous-looking pieces! Whomever wins this book will be lucky indeed. Wow those flowers are stunning. I'd love to make some like that for mother's day. I think they'd be lovely pins or place setting favors. Thanks for the chance to win. I'm so glad I now know about this book! Those flowers are gorgeous! I've never seen anything quite like them. It would be great to learn how to make them! Wow-this looks incredible! I would LOVE to win this book. Thanks for the chance! Awesome, would love to win it as I'm learning to make flowers!! The orchids look fantastic! Would be great presents for my mom and aunts! love the flowers! Thanks for the chance to win this book. I love the butterflies.My daughter is getting married this summer and some of her decorations will include some of my quilling. Wow, that looks like an amazing book, thanks for the chance! Oh, how I would love to learn more about quilling. Those flowers are gorgeous. I am just new to Quilling and would love to learn how to do such beautiful things like this. Wow, what beautiful flowers !! I have been wanting to learn how to make flowers and what to do with them......This book would be perfect !!! Thanks for another chance to win! It looks like a fab book! I love the idea of having actual sizes in it! That helps a newbie like me out a lot! Would love to win the book. Thanks for offering the give-away. Gorgeous work. That orchid is breathtaking. Oh random number generator, please pick me!!! This book looks amazing and if I don't win, I'm definitely buying it!! Hooooooly cow! I've seen quilled monograms, but this is impressive. I would love to make some of these for my friend's wedding shower (when she's engaged--it wont be for another year but I feel like I'd need that much time to make something that detailed!!!) Thanks for the chance to win! What an interesting contest! I will hope for good luck! All the crafts in the book are so gorgeous! Wow! the images you posted are GOR-geous!! Would love to win this book... fingers crossed! I really hope I win. C'mon lucky number 56!!! I love the depth that the layers add to the flowers! This book looks like a visual delight, and would inspire me to take quilling further! Thanks for the chance to win a copy! Lark Crafts books are always special. Thanks for the chance to win this lovely book. Wow! What beautiful art! I would love to read the inside of that book, let alone try it out! This book looks so good. The cover illustrations make the book shout, "open me!". I'd love to win a copy. love her work - this book looks like no exception! Wow--these are so intricate--would love to try this. These flowers are beautiful I would love a copy of this book. Thank You. The zinnia is absolutely stunning. Being relatively new to quilling, I am truly blown away! Thanks for the chance to win what looks like an amazing book. Those flowers are so pretty! I'd love that book! that book looks amazing i would love to win it. thanks for the chance. Another great book! Thanks for the opportunity! I'd LOVE to win this! I've always loved flowers -that's partly why I got into quilling. Many thanks to the publisher! What a lovely book. I would love to try some of the ideas out and I am sure they will make some incredible gifts. Thanks for the opportunity ! This looks like a beautiful book - lovely photos! This would make a great reference and inspiration. Definitely going on my wish list! Wow! These flowers are absolutely gorgeous. I would love to learn how to make them. i love the quilled orchid!! i am an orchid grower myself and i am amazed at the detail!!! If have been wanting to learn how to quill for ages, the orchids in this book would motivate me to finally get started! Thank you for your inspiring blog. Gorgeous! My favorite thing to create with quilling are flowers. I would love to win this book--thanks for hosting a giveaway!! i would love to win this book- the pictures are awesome! this is a great book to be owned for every quiller! Oooh, pretty, pretty flowers. Great giveaway! I'm so in awe of what people do with little pieces of paper. I want to achieve just an iota of that talent. Oh,my. I would luuuvvvv this book. Please pick me! Love love love the flowers! this is a long shot. could i be that lucky just this once? all the way from Malaysia! Anne, Thanks for introducing Alli's new book. Even without your sharing, I always trust Allie's passion on new skills and techniques !!! WOW. Those are amazing. Thanks! I would love to win this book! I have looked through it,but couldn't afford it (helping raise grnadchildren puts a crimp in the wallet, but am so glad I can help they are the real flowers in my life!) But would love to win this as a treat for myself. Thanks again for offering it!! I want the flower quilled book!!! I hope this is the right place to leave a comment...I make flowers with many techniques and materials...and this quilled book looks so incredibly pretty. As always, Ann, I am inspired your your All Things Paper blog. I would love to win this book. Thank you for offering blog candy. Inspiring me to be creative! This looks like a great book. Would love to have a copy. Would love a copy of this book! Such a beautiful form of art. Me, me, me! I would love that book. It is gorgeous! Ohhhh. Have-To-Have! Love this. A definite addition to my collection! Thanks for the chance to get one here! LOVE IT! Thank you for the chance to win! Oooohhh! Flowers AND quilling--a perfect combo. This looks like a fab book thanks for the chance to win a copy. These are truly amazing! I would love to win a book that helps you create these fab flowers! Thanks for the chance to win! These are beautiful! The book would be a great tool. Gorgeous book. I would love the chance to win this. Thank you for the offer! What beautiful flowers! Thanks for the chance to win a copy of the book! What an amazing book...Thanks for bringing this into our notice. Would love to win this one. What a great giveaway. I would love to win this book. I am new to quilling! That book looks wonderful! Thank you for the chance to win. A new book! I need some new ideas. Would love to win. These flowers are beautiful, would love to have the book. Thank you for a chance to win. Yes, please! I still can't even make a flower; I need all the help I can get! Thanks for the chance to win! That is a gorgeous book! I would love to add that to my collection!! This book looks amazing, I've been dying to try my hand at quilling and the flowers look gorgeous!! Thanks for the giveaway! Wow, Just the few photos you share are fantastic. What a great book. This looks like a beautiful book. I have just recently started looking into learning quilling. These look amazing! I would love to win the book. I've been playing with different paper mediums for awhile but haven't yet tackled quilling. I love paper flowers, and those are so pretty! I'd love to learn how to make them. This book looks to be wonderful...wold love to win it!!! Thanks for the chance! They're so beautiful! I would love to win that book. stunning flowers ! would luv to recieve this great book. Thanks for the fantastic giveaway! Thanks for the chance to win this fabulous book. I love the orchids! This book looks amazing! It would be a great way to structure my practice as a new quiller and make some awesome projects in the process! Hi there! Just found your blog and love it! Would love to win that book! Wow those are awesome flowers, I love to do quilling so much fun. Thanks for the chance. Hmm...my first post wouldn't post... I hope this isn't a double post somehow. I love Alli and her books! I am fortunate enough to know her and visit her shop whenever I want! I have seen her new book and it's lovely. I would love to win it as I spend way too much money on quilling and am like a kid in a candy shop when at her store!! I love quilling, such a beautiful and relaxing craft to do. What a fantastic looking book! I love quilling! The zinnia bow is GORGEOUS! I would love to win this book, flowers like these intimidate me. I could use a great tutorial to overcome my fear! I started quilling about a year and a half ago and have fallen in love with the artform. I'm so excited about this book! OH MY GOSH, these are awesome!!! I would love to win this book. My sister and I are beginners & would love to add this book to our collection. Thank you for the opportunity to win this amazing book. What amazing looking flowers! Thanks for the chance! I just started to quill and would love this book! I just had my birthday. This would be a great birthday present for me. I started quilling a couple of months ago and had not seen this book until now. It looks fabulous. I'd love it to be mine. hi!..i tumbled upon the art of paper filigere by chance and now i am all addicted to the colourful world of paper strips!and this book is an amazing compilation of such wonderful designs, cant wait to have it in my treasure. These flowers are gorgeous. I bought a quilling quit at Hobby Lobby when it was on clearance, so I need to learn how to make them. I love it, such beautiful work! I am new to quilling and already an addict to the twirling of paper. I swear, even my dreams have curls these days! Please feed my habit and choose me to send your book to! I would love to learn to quill, the examples you posted from the book are beautiful. I hope I win! Everytime I see the cover to this book with all the beautiful flowers I think I must get it! Thanks for the opportunity to win one here! Oh, I LOVE the Zinnia gift box topper! This would be a wonderful book to win. I would love to own this book. This book looks awesome. Thanks for the chance. WOW! I would love a copy of this book. I've enjoyed Alli's other books and kits. I love looking at Quilled Creations catalog each spring. Wow - this book is gorgeous! Thanks for showing it off and for the chance to win! I just love paper quilling! I have one of Ali's books already and it is a great instructional book for quilling. I would love to add this to my collection! This is nice..Am crossing my fingers so that I would be picked.. This book looks beautiful! I'd love to win this- perfect way to start off spring! these projects look so beautiful! I would love a copy! Thanks for the giveaway! Oh this book looks lovely. That would be so beautiful! Here's hoping for a win! would love a copy to figure out how to make those orchids, they are gorgeous. I am just starting to teach Quilling and would love a chance to learn some new techniques to pass on to my students! I just love her kits and books! Thanks for the chance to win! Goodness sakes, this certainly brings back memories. I learned to do quilling in Vacation Bible School 50 some years ago. I would really like to have this book to do some projects. Thanks for the chnce. This looks to be another must have for a papercrafter's book shelf. The flowers are detailed and lifelike. I love quilling! Thanks for the opportunity to win! This book looks beautiful. Ali's beginner book got me started quilling and I would love to own this one too! I am absolutely new in quilling, and love to learn more about quilling, it is so much fun to see your website and thanks for the chance to win the special book, it will be a great inspiration to me to get start. Wow, those flowers are gorgeous. I've really been wanting to try out quilling so I'll keep my fingers crossed. That zinnia gift bow is gorgeous! Thanks for a chance to win. Wow, the flowers look amazing.